A Nu-Again wood care professional will saturate the woods surfaces with only the highest quality oil based sealer available. This will restore water repellency, prevent the growth of moss and mildew and protect the surface from photo degradation and hydrolysis by sunlight. Nu-Again Penetrating Oil is a technologically advanced oil based finish that effectively penetrates, seals and protects exterior wood surfaces, its oil based formulation provides maximum protection against water & moisture penetration, Provides maximum protection against mildew and algae growth & contains powerful UV screens which filter out the sun’s harmful rays. Will not blister, crack, peel or flake. Tested in the harshest climates. Most technologically advanced wood sealer available. 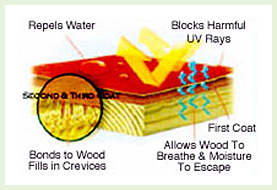 UV blocker & absorbers prolong color retention and resist wood graying. Is your deck cleaning service complete? Time to move along to our Deck Sealing Process. 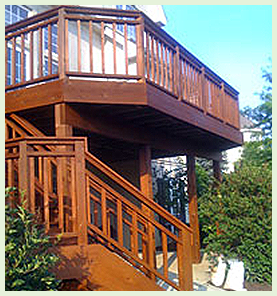 Please feel free to call us at 833.200.7822 or fax your requests to 630.513.6915 for superior deck sealing services. Why should you protect exterior wood? 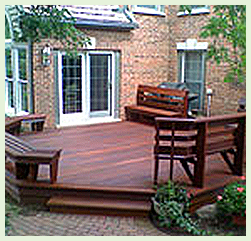 In St. Charles, Illinois, the damaging effects of weather to unprotected wood begin immediately. Rain, melting snow, and morning dew are quickly absorbed by unprotected wood, causing it to soften and swell. The sun's heat causes drying, which makes the wood shrink. These cycles of wet and dry, swelling and shrinking cause wood to warp, split, crack — all of which lead to premature wood life and expensive repairs. Unprotected wood is subject to mildew and algae growth, rot and decay, surface graying and degradation from Ultra Violet (UV) rays from the sun, as well as insect attack from a variety of sources. 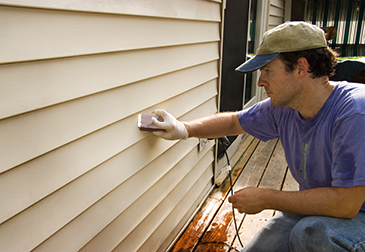 To protect exterior wood from the elements, rely on the professionals at Nu-Again to clean, beautify and protect.